When we moved in 8 months ago, we actually both said we wouldn’t touch the kitchen as it was “liveable”, not our style but it would do and probably be the last thing we touched in our renovation project…it took about a month before we had started planning what we wanted to change. We spend most of our time in this part of the house. It is a horse shoe shape as the previous owners added a generous extension onto the rear of the property, and is an absolutely amazing space for entertaining. It gives us a second more casual lounge, dining area, and kitchen space all in one, and we love it! (It was the selling point of the house when we were buying). 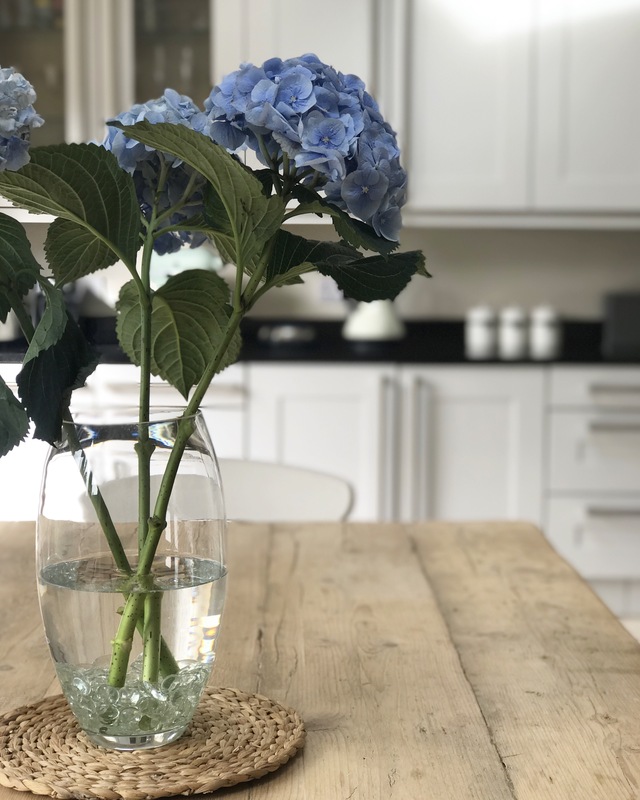 Because of this though, it quickly became apparent that we really did want this space to reflect our styles (not the previous owners), and there was only so much we could do with furniture and accessories. 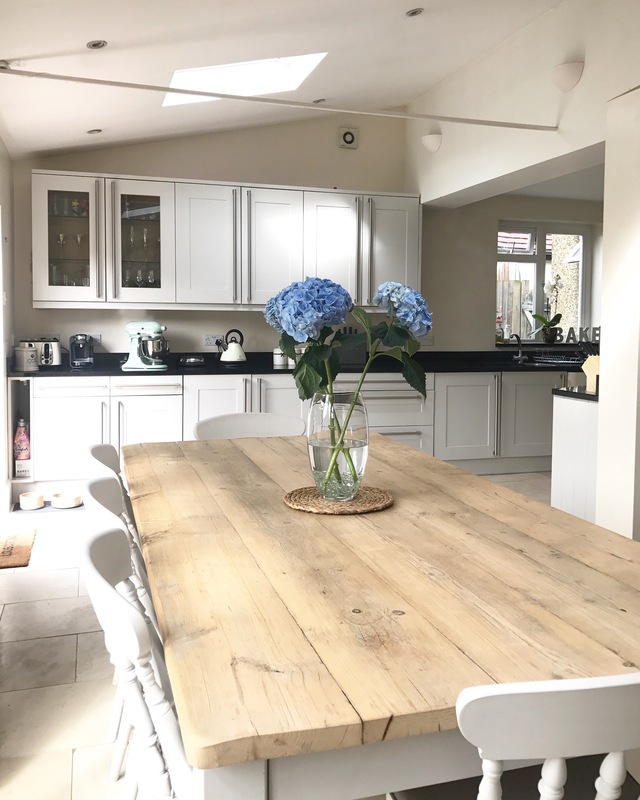 The colour of the kitchen cabinets had never matched our colour scheme of reclaimed wood and light country style colours. We’ve kept a mix-match of colours in this space with the table, sideboard, and TV unit (Cornforth white, French grey, mid grey respectively). The orange wood was way too dark in this space for us, so we decided that the first thing we needed to do out here was re-paint the units…easier said than done! We knew we needed a colour that would fit in with the already placed granite worktops (we’d be silly to replace those! ), as well as our lighter colour scheme, but it took us a few weeks to decide and find the one we eventually went for. 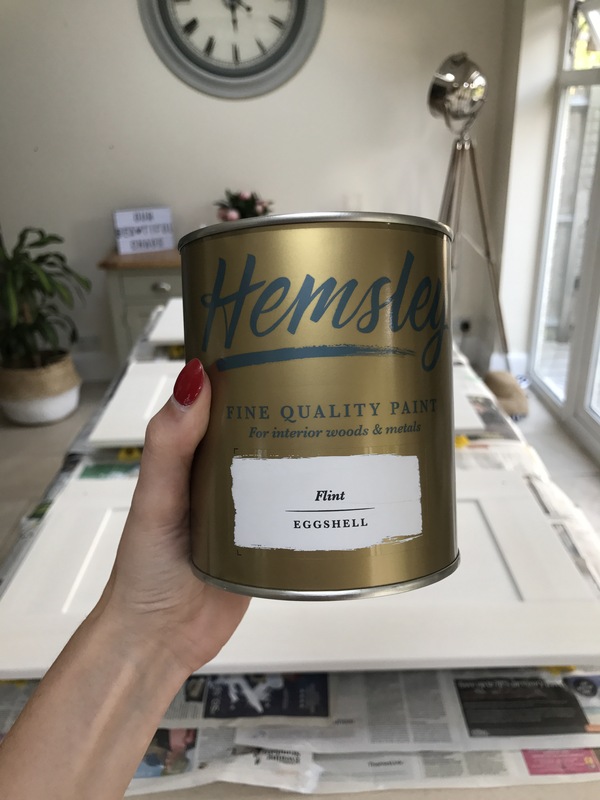 The paint colour we eventually decided on was ‘Flint’ by Hemsley. We wanted something similar to Farrow and Ball’s Skimming Stone but slightly more grey (and less expensive), and found a really nice Laura Ashley paint with the same namesake that was then discontinued *of course*. We landed on Hemsley as a complete fluke (turned down the wrong aisle!) and absolutely love it! 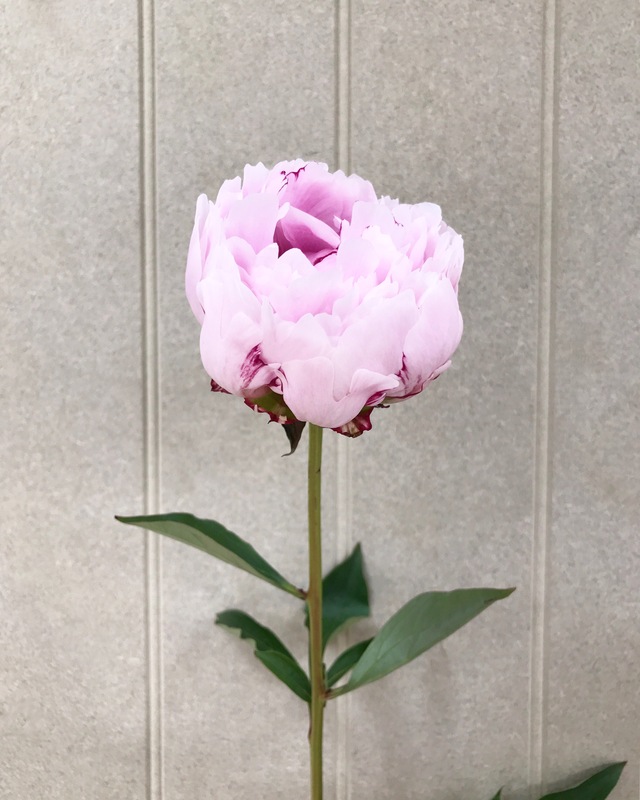 It has the same consistency as Farrow and Ball, comes in a beautiful range of colours, has a gorgeous colour chart, and is less than half the price! First things first…sanding. 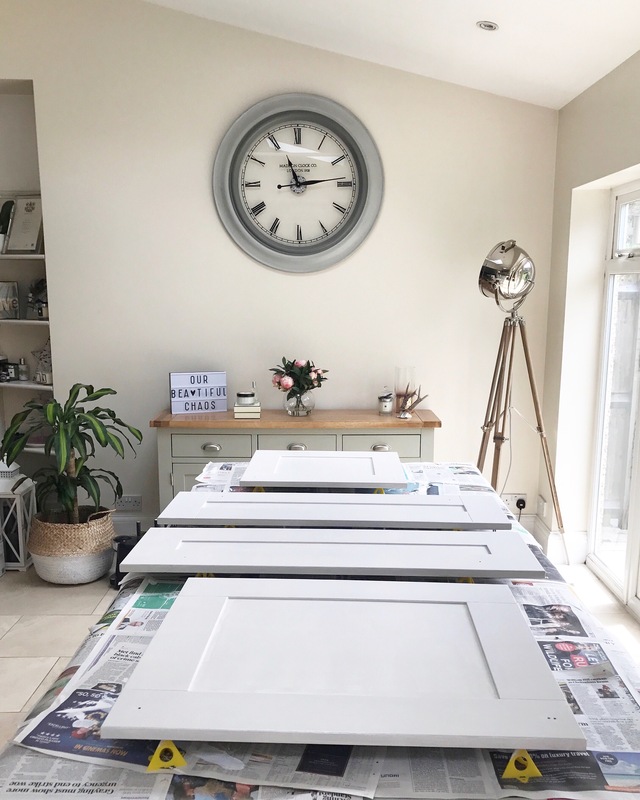 After removing all of the doors and door handles in order (with me noting down every door’s position and collecting the brackets and screws in plastic food bags for each set of doors – yes my OCD played a vital role) it was time to get rid of the orange varnish. We stayed well away from this job and asked MrB’s Dad if he’d help us for the weekend. Luckily he’s a carpenter and has worked with wood his whole life, so he came with everything we needed, including a small electric sander, which took the orange varnish off quicker and more evenly than we ever could by hand. 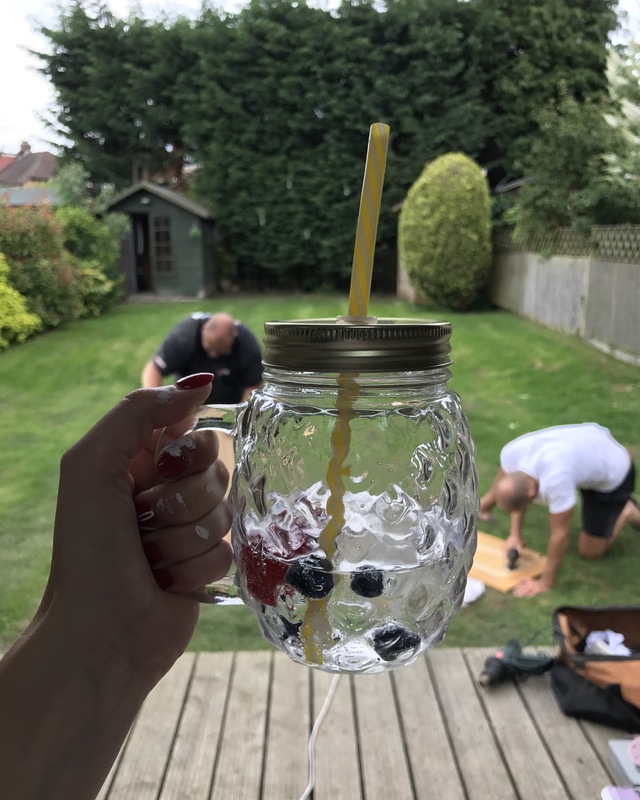 It took the whole first day to sand down 90% of the doors front and back, kickboards, and unit fronts – I don’t think we realised how big a job this was going to be until we saw everything strewn across the garden! Thankfully MrB Snr stayed with us for two days to get everything sanded and prepped ready to start priming. 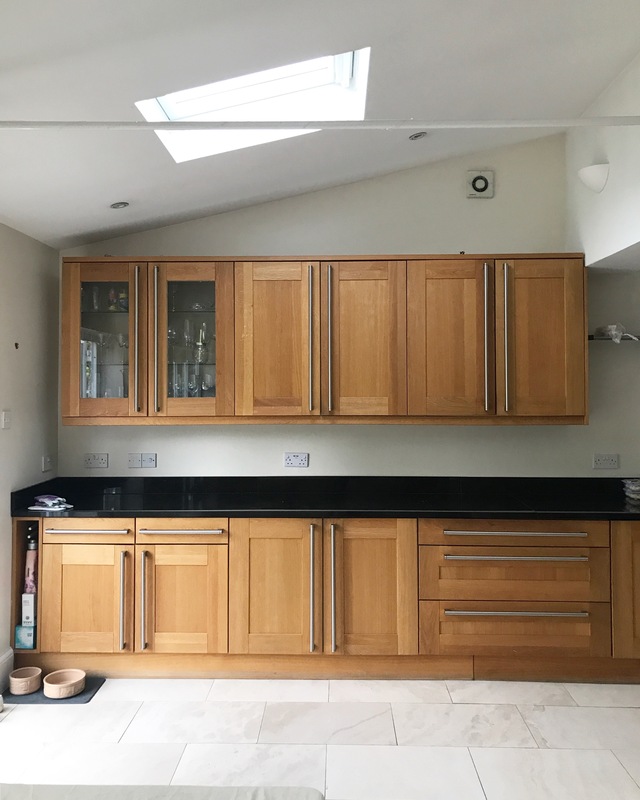 We have three large side panels on our kitchen units that are visible from all angles and decided that we wanted to make more of a feature of them. We chose to use tongue and groove panels that you can cut to any size. These were fantastic as they gave a beautiful finish at a really cost effective price! We used an adhesive gun to fix them to the sides of the units, and put a couple of small tacks in to hold in place whilst the adhesive set. This was one of the best changes we made, and gave it such a professional finish – even before it was primed! 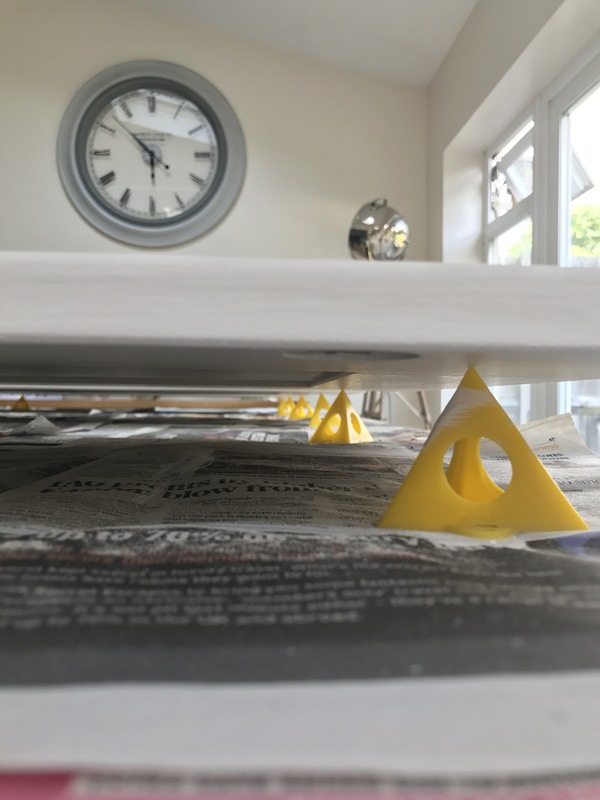 As much as I was excited to start painting, priming has never really filled me with joy, as it’s one of those jobs that’s essential but you never see! (All renovation prep makes me feel like this). It also became quickly apparent that we would need 3 coats of primer to get a solid white finish ready for the colour, which honestly made my heart sink. 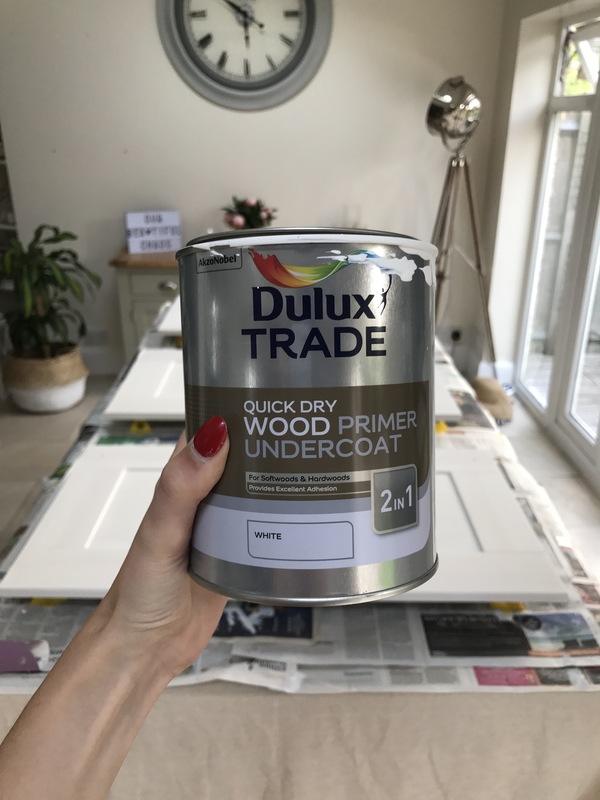 As we were going for a light paint colour, we wanted to make sure we have a solid white base, however if you were using a darker paint colour you could definitely get away with just 2 coats. We decided to get all of the kickboards and units primed first, as well as painted, as they were huge and imposing and took a lot of time. This worked for us as it meant that the kickboards could go back in place after only a few days (and we could have some type of normality amongst the chaos!). 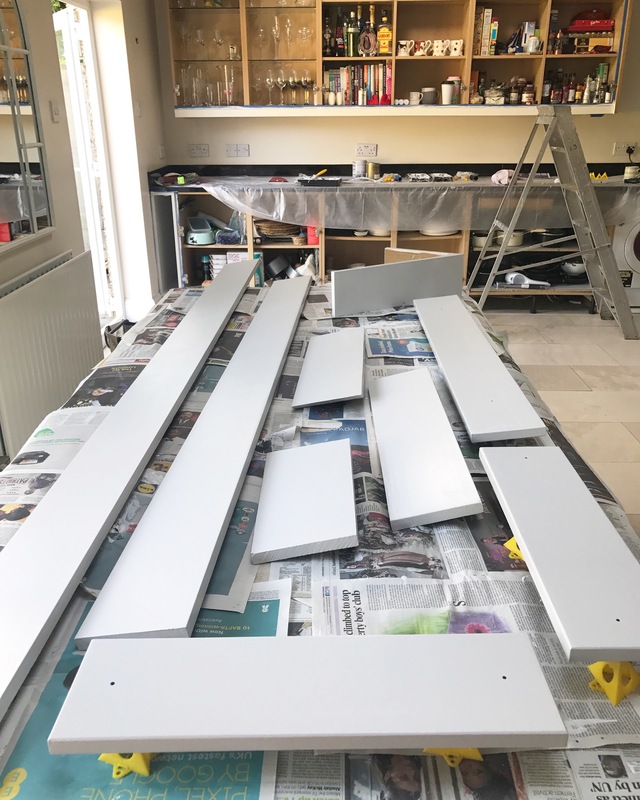 Once the kickboards and units were primed and painted and back in place, we then moved onto the kitchen cabinets, working in batches of 5 as we didn’t have a lot of work space inside the house (my poor table was our work bench throughout!). Once again they needed 3 coats of primer, the first and second coat needing 4 hours to dry each, and 9 hours (or overnight) after the third coat to ensure that it was completely dry. They were then ready for painting! This is definitely my favourite part of any renovation as you get to see what it will eventually look like. We decided on 2 coats on the back of the doors, and 3 coats on the front. As you can imagine, this took a long time. We had 20 doors and drawers that all needed three coats and all took 2 days to finish because of the drying time between each coat. Take into account we had to work in batches of 5 and you can start to imagine how long this all took. THE BEST find of the whole project were these painters pyramids. 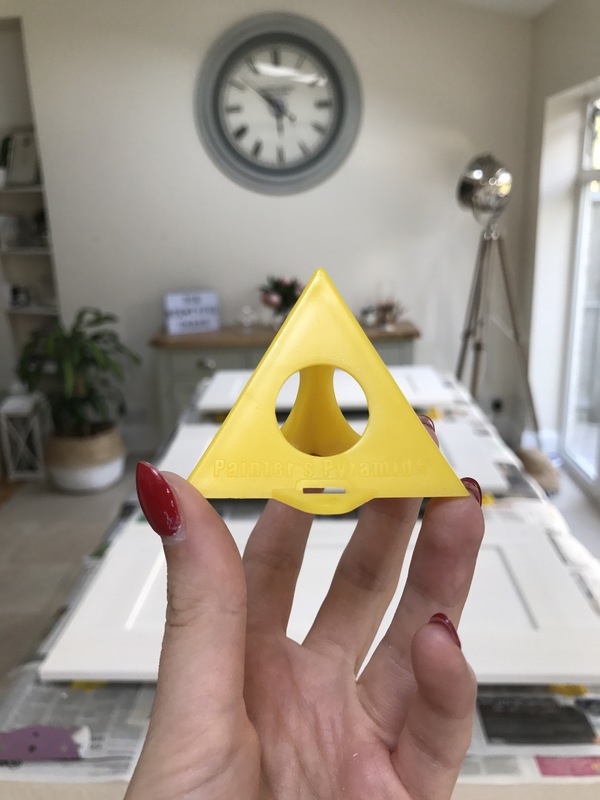 Small yellow plastic pyramids that you place strategically under the doors, meaning you can paint both sides and both can be drying at once. This reduced the time of the entire project and meant that we could make the most of the limited work space we had. In the end it took us 2 weeks, painting every single day, to get the first phase of the kitchen renovation finished and it was 100% worth the chaotic living and 6 coats! Despite me going through a phase shortly after completing the units of never wanting to see a paintbrush ever again, just looking at what we achieved and the difference it makes to the space, makes me incredibly happy. MrB and I are complete novices, and renovating takes us a long time, however what an amazing sense of achievement. It may take us 30 years to finish the whole house, but what a bloody exciting 30 years they will be. Interesting read! We have agreed not to change our kitchen as this isn’t our forever home, and the kitchen that is in is modern so there isn’t any need, but it isn’t me at all but the doors are a high gloss finish so we couldn’t paint them or I would of done the exact same thing! Amazing the difference it makes! It looks gorgeous!